The Dragonlings are up to more mischief when they discover that the Queen of the Demented Symbiots plans to send her minions to kidnap the new babies: Morah, Hope, and Leo. The Dragonlings and their besties are excited about the preparations for another Halloween holiday. 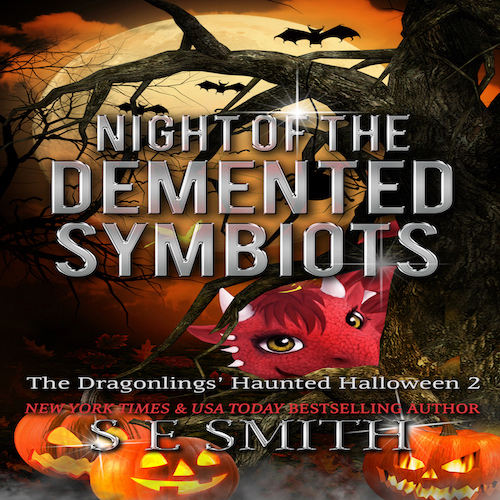 As the night of the festival draws closer, the Dragonlings, Roam, and Alice discover a threat to the newest members of their families; the Queen of the Demented Symbiots plan to send her minions to capture the new babies and take them to the land of Halloween where she lives. With their parents busy organizing for the huge festival for the people of Valdier in the underground cavern, the babies are left with no choice but to prepare for the ultimate battle – to save Morah, Leo, and Hope from the Queen of the Demented Symbiots! Join in a holiday adventure that you won’t forget as the little ones use their special skills to protect their friends and family in The Dragonlings’ Haunted Halloween 2: Night of the Demented Symbiots! You are just as bad as the girls. You know that, don’t you? He grimaced. You like, too, his dragon growled back. Where are they? Trelon asked, trying to motionless while he listened. In the background, he could hear Cara grumbling under her breath that she knew she had replaced the cloner in her tool bag earlier. He focused, trying to pinpoint any unusual sound. The girls were getting better, he thought with pride. Raising his head, he tried to see if he could catch a glimpse of them. Up! His dragon warned. Trelon jerked his head up at the same time as Amber tumbled over the back of the couch. Before she rolled off the front of it, he rose up on his knees with a deep, husky laugh and opened his arms to catch her. At the same time as his arms wrapped around Amber, he felt Jade sliding her arms around his neck. “We got you’s, Daddy!” Jade giggled in his right ear. “Hi, Daddy,” Amber laughed, staring up at him with bright, golden eyes. Trelon’s gaze lit up with delight. He would never, ever get tired of seeing the glowing faces of his daughters. His eyes lifted when he saw a movement on the other side of the couch. His gaze locked on Cara’s face, flushed from her frantic search. She was staring at him with an expression that he greedily held onto – love. The warmth of it surrounded him, causing everything else to fade for a moment. OMG! Dear Lady, you have an extraordinary mindscapes!! I love to visit them all. So when is my next vacation? : ) I know, I’m greedy, but I do love my vacations. Thank you for sharing your inner worlds with us. The Valdier world will always be my favorite because is the series that introduce me to your story telling. I have expanded to your other series but I will never forget my first. They have become entrenched into my own mindscape. A fictional family of sort, so I’m always curious about them and how the babies are doing. I did relish this one. I’m concern about little Phoenix, she appears to have so much on her shoulders. I have a tremendous affinity with that character. The Phoenix has always been one of my special symbols since I was three and became aware of Herodotus; The greek historian. Yes, I was one of those children that knew too much saw too much, felt too much by the time I was two. The awareness was painful. So Phoenix is my girl. The one thing about your writing that I love is the underlining of integrity, respect, humor and love that you bestow upon your characters. I know she will be loved by her family. Maybe not understood, because that would demand a scope similar to hers. Love will take the sting of not actually be understood. Ouch, that became too serious! ROFL!!!!!!!! May your joys be many and your strife be few. Feel free not to post this message. I just wanted to make a theory on any future siblings the dragonlings may have (if there are to be more children). I see Zohar with a little sister, the twins Amber and Jade a little brother, Balint, twin siblings a boy and girl, Jabir a little brother, and the twins Phoenix and Spring are enough for Creon and Carmen. It will be fun to see how close I am in my theory if or when you write more in this wonderful series. So far, you are doing fabulous! Cara and Trelon are expecting another one – a little boy. The families are growing. I truly enjoy writing about them and their adventures. I think the best thing is being able to write all kinds of stories. Since I never know what is going to happen, I’m looking forward to seeing if your predictions come true. LOL. I am really enjoying this book, I am taking my time and savouring every word. Little chuckles keep escaping which is really cheering me up. Thank you for such a wonderful book. Thank you, Heather, for sharing this. I love being able to bring laughter to the world. Thank you again for brightening mine by sharing your enjoyment with me! 1 more day! Can’t wait!!! !